Once a year, the members of the Movement should reserve a longer amount of time for their contact with God through a triduum of renewal or spiritual exercises. The Triduum of renewal is three days long, while spiritual exercises may last as long as six to eight days. Spiritual exercises have a specific internal dynamism which, counting on the help of divine grace, leads the earnest retreatant to a strong spiritual experience of conversion and identification with Christ. As an apostolate of the Regnum Christi Movement, Our Lady of Bethesda is proud to serve Regnum Christi members seeking to grow in their faith and deepen their vocation. Regnum Christi Renewal Retreats are a means of perseverance for all Regnum Christi members. These Ignatian Spiritual Exercises incorporate the spirituality of the Movement and strengthen members in their formation and vocation. To find out more about Regnum Christi, visit this website: www.regnumchristi.org. 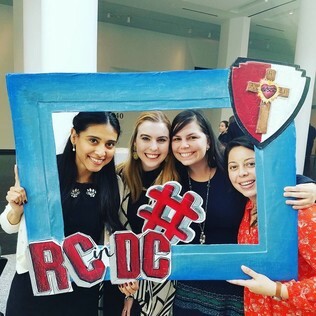 Check out what Regnum Christi is doing is the DC area: www.regnumchristidc.org.